Movies have the Oscars. TV has the Emmy's. We have the Telly's…literally. This year CBH Video set a company record when we were honored with four Telly awards, including one Silver and three Bronze Telly Awards, in the 33rd Annual Telly Awards. “We believe video is a powerful way to inspire and motivate audiences," said CBH Video President and Owner Carole Burke Hallberg. "It’s a great honor for our team to receive this type of recognition from our peers. We have a very talented team of professionals who take great pride in their work and it shows." The Telly Awards is the premier award recognizing outstanding local, regional, and cable TV commercials and programs, as well as the finest video and film productions, and web commercials, videos and films. With nearly 11,000 entries from all 50 states and numerous countries, these awards are truly an honor. A judging panel of over 500 accomplished industry professionals judged the competition and evaluated entries to recognize distinction in creative work – entries do not compete against each other – rather entries are judged against a high standard of merit. The judges rate each entry on a 10 point scale. A score of 9 or higher merits a Silver Telly, while a score of 7.0 -8.9 receives a Bronze Telly. Nearly 10-percent of entries are chosen as Winners of the Silver Telly, the highest honor. Our entry, a recruitment video titled "Become Involved, Become a Lion," is the first video produced by our team to win a Silver Telly. Approximately 25-percent of entries are chosen as Winners of the Bronze Telly and CBH Video is especially proud to be the recipient of three Bronze Telly awards this year for our entries: "Joplin Disaster Relief," "In Times of Disaster…Lions are There," and "LQ, January 2012." 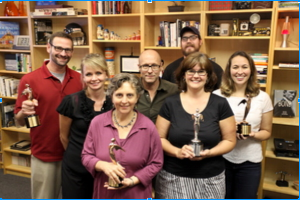 CBH Video has won numerous Telly Awards since 2002, but this year marks the highest number of Telly Awards in our company's history. We are very proud of each member on our team who devotes a great deal of time and creativity to ensure the videos we produce are highly effective and unique; This year's success is the icing on the cake and preview of great things to come for 2013. "We have a successful history of producing outstanding videos for Lions Clubs International," Burke Hallberg said. "We are grateful for the opportunity to collaborate with Lions to create powerful and meaningful videos that showcase their global leadership in humanitarian service. A big creative bar was set for us and our goal is to reach even higher in 2013."